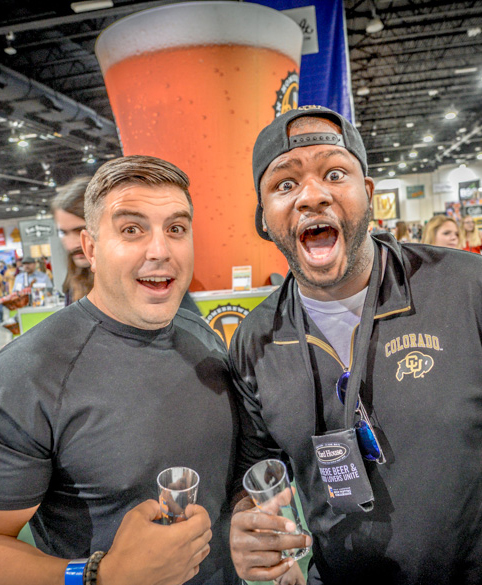 The Great American Beer Festival takes place at the Colorado Convention Center in Denver. Please visit Hotels for accommodations and Getting Here for public transportation, driving and parking information. What are the future dates for the Great American Beer Festival? Why visit the Great American Beer Festival? What’s the history of the Great American Beer Festival? Who puts on the Great American Beer Festival? Is the Great American Beer Festival like a giant bar? Why is the Saturday Afternoon Connoisseur Session now a Members Only Session? Will there be festival and brewery merchandise for sale? Will there be any gluten-free beers available? Should I drive or take public transportation? Why are the tasting cups plastic? How can breweries run out of beer? What’s this I hear about a free app? 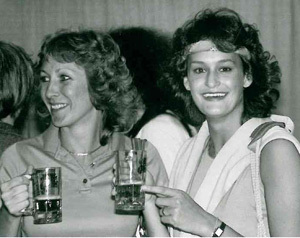 The first festival was held in 1982 at the Harvest House Hotel in Boulder. There were 24 breweries, 47 beers and 800 attendees. The festival moved to Denver in 1984. The 10th festival was held at the Denver Merchandise Mart with 150 breweries, 500 beers and 7,000 attendees. Due to continued growth and popularity and the fact that the iconic Currigan Hall was being dismantled, the festival moved from Currigan Hall in Denver to the Colorado Convention Center in 2000. Demand for tickets is at an all-time high. The 2007 festival sold out the week of the event, while the 2014 event sold out in just over four hours. The Great American Beer Festival is the American brewing industry’s top public tasting opportunity and competition. Tasting sessions will offer attendees the opportunity to tour America’s brewing landscape, one ounce at a time, with access to more than 4,000 different beers from over 800 of the nation’s finest breweries. The GABF gathers practically every type of beer from all of the regions of the country, and are arranged alphabetically in the festival hall. The festival allows visitors to taste the largest number and the widest variety of hand-crafted products in the American beer industry. The Great American Beer Festival has been held every year since 1982 and is presented by the Brewers Association, a not-for-profit educational and trade organization that is devoted to making quality brewing and beer information available to anyone. The Brewers Association also promotes and protects American craft beer, American craft brewers, and the community of brewing enthusiasts. The Brewers Association serves craft brewers and homebrewers and produces bi-monthly magazines and books about the brewing industry. The goal of the Great American Beer Festival is to allow attendees to taste a variety of new brands and different styles of beer. To allow guests to taste American craft beer, samples are poured in one-ounce tasting portions. See Tickets section for pricing information. Why is the Saturday Afternoon Session a Members Only Session? The Brewers Association is a member-based organization. We have heard from our members that the Saturday Afternoon Session is one of their most valued member benefits. In an effort to be responsive to our members, yet still make the session available to beer enthusiasts, we have modified ticket prices and requirements. To attend the Saturday Afternoon Members Only Session you must be a member of one of our two organizations: the Brewers Association (professional brewing industry) or the American Homebrewers Association® (amateur and brewing enthusiasts). If I don’t homebrew, what can I do with this membership? One of the best benefits of being an American Homebrewers Association member is using your membership card to get discounts at breweries, brewpubs, and beer bars across the country through AHA Member Deals. Depending on the laws of your state, discounts may be on beer, food, homebrewing supplies and more. We know you love beer and likely already visit the great establishments involved in our program. We currently have 2,000+participating locations offering discounts. Browse the list of participating locations! If you have any questions, please contact us via info@brewersassociation.org or call 1.888.822.6273. You must be 21+ years old with a valid photo ID to attend the festival. Yes, Designated Driver tickets are available for all sessions for $30 each. Free, non-alcoholic sodas will be available. Designated Drivers are welcome to attend the beer and food seminars, walk around the festival floor, or relax in the Designated Driver Lounge. You must be 21+ years old with a valid photo ID to attend the festival. Do you accept credit cards or checks at the GABF merchandise booth? We accept cash and major credit cards including Visa, Mastercard and American Express. No personal checks accepted. There is an ATM in the Colorado Convention Center lobby. Last pour is 15 minutes prior to session end time. Tickets are available via AXS.com. See Buy Tickets for more information. You must be 21+ years old with a valid photo ID to attend the festival. Note: Tickets sell quickly! Please plan accordingly. There will not be a coat check. Also, lockers are not available for rent. Backpacks are not permitted in the festival, so please plan accordingly. Although we highly recommend leaving all children at home, children under age 2 are allowed, only if carried by a parent at all times. Keep in mind the festival hall can get extremely loud. No strollers or personal backpacks are allowed in the hall. Baby backpacks are allowed. Many beer enthusiasts line up well in advance for the festival, and there will most likely be a line at the entrance to the Great American Beer Festival. An ID check of all who enter the festival is required. The line will move quickly if you have your ID out to make the age verification process run smoothly. There will be a variety of food, water and sodas available for purchase onsite. This includes food trucks, as well as a selection of other concessions. Complimentary water stations are also provided. Yes! There are two places to pick up some sweet merch at GABF: the main merchandise area, located near Aisles 8 & 9 (look for the giant wall o’ t-shirts) and the mini-merch store in the Meet the Brewer hall between aisle 18 & 20, which offers a limited selection of commemorative items. Stop by for all the latest garb from your favorite breweries and official Great American Beer Festival merchandise! Find all sorts of souvenirs, including ladies-cut shirts, pint glasses, hats and hoodies. There is something for everyone! As this event draws an estimated 62,000 people over the course of three days, downtown parking can be difficult. Public transportation is always recommended when drinking alcohol. We would like to offer a few alternate options for you. Stay at a downtown hotel, and take a taxi or walk. Taxis will be available after all sessions. There is a Regional Transportation District (RTD) bus stop a few blocks from the Convention Center, and the buses run until 1:00 am. Denver’s Light Rail is also a convenient option. There is ample parking at the Cinderella City Station (located at the intersection of Santa Fe Avenue and Hampden Avenue). The Light Rail stops directly in front of the Convention Center. Designated Driver tickets are available for a discounted rate. Looking to see the city by bike? Denver B-Cycle offers short term bike share rentals at dozens of stations around the city, including one right by the Colorado Convention Center. Please do not drink and ride! Parking is available at the Colorado Convention Center parking garage 24 hours a day, 7 days a week. The Colorado Convention center rules stipulate that no glass will be allowed at the evening sessions. The cups provided are made of Lexan, an odorless and tasteless plastic. Glass tasting glasses are given only at the Saturday Afternoon Members Only Session and at PAIRED. Remember, Savor the Flavor Responsibly! Occasionally, a brewery will run out of a certain beer. The beer may be overly popular with the festival crowd. Luckily, there are more than 4,000 beers to sample. If you miss a beer this year, you will have to remember to try it early the next year! The free My GABF app is your trusty companion at the Great American Beer Festival! With the app you can browse the brewery list, save breweries you love, jot down notes on the beers you’ve tasted, and take guided beer tours based on your favorite styles. Get it for iPhone or Android. Empty, CLEAR, reusable, plastic water bottles are permitted e.g., Nalgene bottles (32 oz. or less). Glass bottles are prohibited. The Great American Beer Festival has a no re-entry policy. Please plan accordingly. The Colorado Convention Center is a non-smoking facility. A designated smoking area is located on the loading docks just off the festival hall. All guests of the Great American Beer Festival are expected to drink responsibly and ensure they have a safe, responsible means of transportation before leaving the facility. Any guest found intoxicated within the event and causing a disturbance, as determined by management, will be asked to leave the facility without refund and may be subject to further consequences. Unauthorized distribution of literature, business cards, flyers, handouts, pamphlets, other written forms, etc. Chanting or shouting words associated with commercial advertising. Possessing signs/flags/banners/posters displaying words or pictures associated with commercial advertising. All cases are subject to review and decision by event management. Guests found to be marketing as determined by management may be subject to ejection. Guests found passing out literature or any written forms of unauthorized marketing will be asked to collect all pieces of marketing handed out and dispose of them in the trash or recycling. Any additional pieces of marketing found make the guest/marketing company subject to being billed for cleanup costs. Guests/companies repeatedly found marketing on property may be cited with trespassing. Backpacks (i.e. a multi compartment/multi strap bag) suitcases, large beach bags, etc. All bags, jackets, and guests are subject to search upon entering the event. Items which have varying policies include: cameras, video/audio recording equipment, and signs/flags/banners/posters. Guests are welcome to bring personal cameras into the event. Professional photography access is determined on a case by case basis by event management. See Media Access. Guests must possess a valid ticket at all times. Guests unable to produce a ticket may be ejected from the event without refund. Guests who attempt to “sneak” into the facility may be arrested and cited for evasion of admission. *Note—These policies and procedures that are subject to change and update at any time. All attendees (ticketholders, brewers, media, etc.) will be asked to go through a walk-through metal detector, similar to the units used at all major U.S. airports and professional stadiums and arenas. Backpacks are prohibited for this event and all items are subject to screening. The added security precaution represents GABF’s ongoing approach to balancing safety and fun. Keeping hydrated is a major part of attending any festival! Great American Beer Festival has made the commitment to provide FREE water stations during each session. You will be able to bring an empty, CLEAR, reusable, plastic water bottle up to 32 oz. into the Colorado Convention Center, which may be filled for free at the water stations. Glass bottles are prohibited. All water stations will be easily identifiable on festival maps and with onsite signage.